Osteoporosis is a disease that causes bone weakness and subsequently increases the risk of developing bone fractures. While it is commonly associated with elderly women, it can happen to men as well. According to the National Osteoporosis Foundation, osteoporosis is a serious public health concern affecting more than 200 million people worldwide. A new study that the Department of Nutrition and Exercise Physiology recently published shows that in men, long-term weight-bearing exercises decrease sclerostin, a protein made in the bone, and increase IGF-1 (insulin-like growth factor 1), a hormone associated with bone growth. Pamala Hinton, associate professor of nutrition and exercise physiology, is hopeful that the results of this study will not only promote exercise as a preventative measure for osteoporosis in men but also raise awareness of the specific exercises that work best. “People may be physically active, and many times people know they need to exercise to prevent obesity, heart disease or diabetes, however, you really need to do specific exercises to protect bone health,” Hinton went on to say. This particular study gathered male participants between the ages of 25 and 60 years old who had low bone mass. They were then split into two groups: one group performed resistance-type exercise training like squats and lunges using free weights, and the other group performed various types of jumps, such as single leg and double leg jumps. The study continued for 12 months, and when concluded, Hinton and her team compared the levels of bone proteins and hormones found in the blood. What they found was that in both groups of men, levels of sclerostin were decreased. This is good for the bones, as sclerostin has a negative effect on bone formation when levels are high. So, in both resistance and jumping exercises, sclerostin in the bone goes down, promoting bone formation. The other hormone being studied, IGF-1, also showed a positive effect in the two groups. Unlike sclerostin, IGF-1 stimulates bone growth and was increased in both exercise groups, confirming Hinton’s prior research. Hinton wanted to prove that while exercises like swimming and cycling are great for promoting overall health, exercises specifically promoting bone formation should be emphasized. 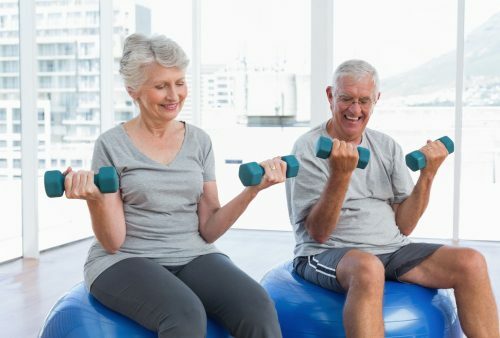 While most exercises work to prevent obesity and heart disease, they are better tailored for losing fat than strengthening bones, and incorporating exercises such as resistance or jump training should be recommended to people at risk for osteoporosis.